Have I ever mentioned to you guys how much I love Groupon? If not, then get ready for a Groupon love fest from Jerm, as this is one of the greatest web sites ever invented! Today that rings even more true as there is an awesome Tampa Groupon today for one of our Tampa Bay & Company members! 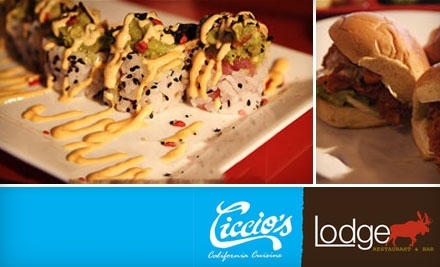 Our friends over at Ciccio&apos;s Lodge in New Tampa are offering the awesome deal of $12 for $25 Worth of Contemporary American Fare and Drinks! If you haven&apos;t dined here before, then be sure to check out the menu as its on my list of favorite eateries here in Tampa! If your not familiar with Groupon and how it works, here is a quick overview of how to sign up and start getting. Go to the GrouponTampa.com website and enter your email address or also you can log-in with your Facebook account. After that you can setup preferences as far as how you would like to receive your Groupons. These are really great deals folks as often times you can receive discounts at restaurants retailers, etc of up to 50% and more! I personally have my Groupon deals coming to me everyday so that I am sure not to miss out on a great offer and I suggest you do the same, especially with one as awesome as today&apos;s! Anyhow, be sure to take advantage of this one folks as its a great Tampa Bay dining establishment! That&apos;s all for now, but be sure to check back soon for more updates on where to eat in Tampa Bay!